Morocco and Spain two neighbouring countries with centuries-old shared history are setting the example of a north-south partnership that managed to put aside thorny territorial disputes. Spain is Morocco’s top trading partner both in terms of imports and exports with total trade standing at €14 billion in 2017. Morocco ranks first in the list of Spain’s fruit and vegetables suppliers with Spanish vessels being the first beneficiary of the Moroccan-EU fisheries agreement. The two countries also cooperate closely on a range of issues including countering illegal migration and terrorism. The two countries cooperate in countering terrorist groups and traffickers. Last week, a terrorist cell loyal to IS was dismantled in a joint operation between Moroccan and Spanish security services. In the EU, Morocco has relied on the official support of Spain to counter the opponents of its territorial integrity. “Morocco can rely on Spain as a partner and friend inside the EU,” said Spain’s foreign minister Alfonso Dastis on Wednesday. He told the press following talks with his Moroccan peer that Spain will support Morocco maintain its special relationship with the EU. These statements come as Morocco and the EU are negotiating a new fisheries agreement against the backdrop of an ambiguous verdict by the European court of justice questioning Morocco’s sovereignty over the Sahara. 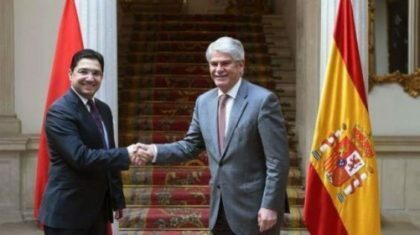 Dastis described Spanish-Moroccan ties as a “model” in the region, adding that the upcoming visit by the Spanish Monarch to Morocco will further foster bilateral cooperation. The pragmatism of the two countries enabled to keep the territorial dispute over the Spanish occupied cities of Ceuta and Melilla away from affecting economic, security and cultural partnership. Morocco claims the two cities lying in the northernmost tips on its territory on the Mediterranean while Spain maintains that they are part of the Spanish territory.